New Zealand librarian and historian Rosie Bevan contacted the Brookmans Park Newsletter in an effort to find out more about her ancestors, the Knolles and Frowick families. 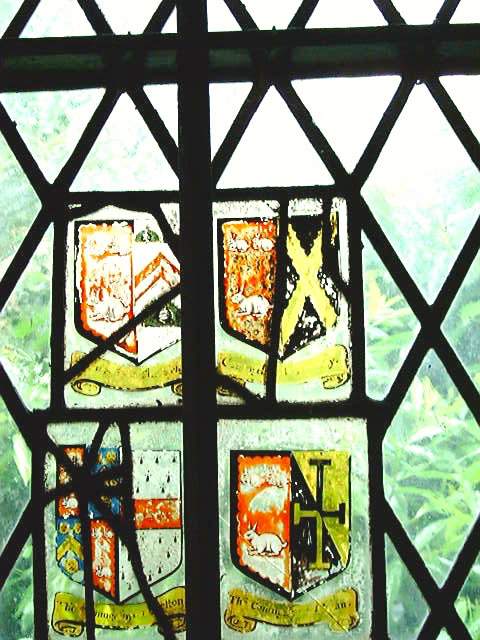 The search led Rosie to St Mary's Church, North Mymms, where a tomb, stained glass windows, and brass memorials containing important family information were discovered. Rosie then wrote a feature for this site about both families. Online editor's note: The spelling of some names throughout this piece changes; this is typical of the time. So you will see Frowick also spelt Frowyk and Frowyck. You will also see South Mymms with a 'y' and South Mimms with an 'i'. Located only 20 miles from London, North Mymms must have been an ideal country retreat for the wealthier inhabitants of the City in medieval times, especially during the summer months when disease was rife, owing to lack of sanitation. Simon Swonlond, merchant and one time Lord Mayor of London, certainly thought so, and so did Sir Thomas Knolles when he purchased three quarters of the Manor of North Mymms from Simon's descendants in 1428. Sir Thomas and his wife Joan had already purchased a quarter share from Beatrix Bakston in 1391 for 100 marks of silver and this later consolidation now meant that Sir Thomas was Lord of the manor of North Mymms. 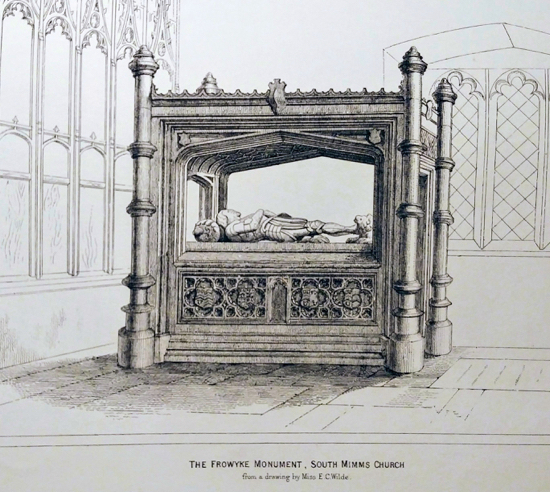 Sir Thomas is said to have been son of Sir Robert Knolles who is mentioned in Froissart's Chronicles and captain in the wars against France, Spain and Brittany under three kings Edward III, Richard II and Henry IV, and was buried with full military honours in Whitefriars, London in 1407. 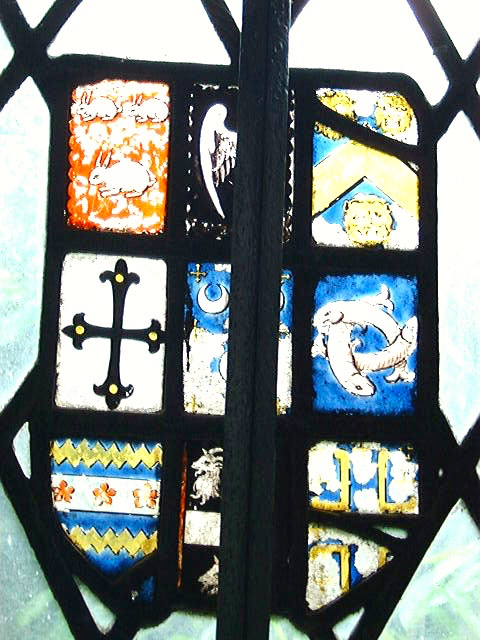 His arms displayed in the church window at North Mymms suggest, at least, that the family believed themselves descended from him. Whether or not Sir Thomas and his family spent much time there is impossible to gauge, for his business and political interests were centred around London. He lived in Cordwainer Street, was an Alderman, and Lord Mayor twice in 1399 and 1410. "This Sir Thomas Knollys, the Lord Mayor, with the aldermen of his brethren, began in 1400 to build the new Guildhall. He re edified St Antholin's Church in Watling St and gave to the Grocer's Company, of which he was a member, his house near that church for the relief of the poor for ever; and caused water to be conveyed to the gate of Newgate and Ludgate for the use of the prisoners." 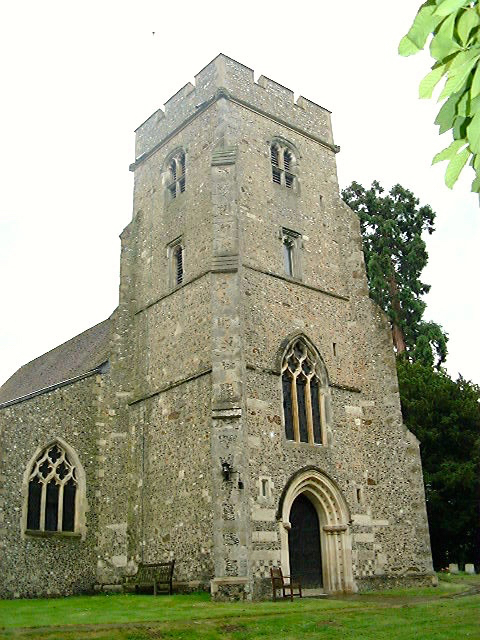 Also attributed to him is the church tower of St Mary's at North Mymms, dated around 1428 which would be in keeping with his philanthropic and religious benefactions. 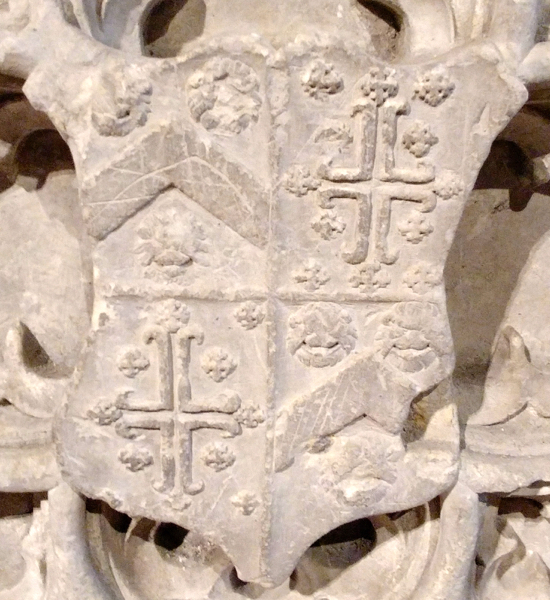 Sir Thomas died in 1435, and was buried with his wife, Joan, in St Antholin's Church in the north aisle. On their tomb was the following epitaph. Christ have there Sowlys to heven bliss. Amen"
And x chyldren they had in fere. Many good dedys they did wyrch. For, wheder he be smal or gret, All sall turne to wormy mete. An Mcccc five and forty. Grant us the holy trinite. 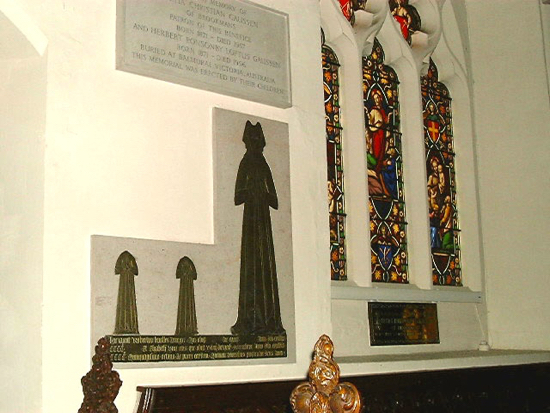 Amen"
Sadly, St Antholin's church and these memorials were destroyed in the Fire of London in 1666. 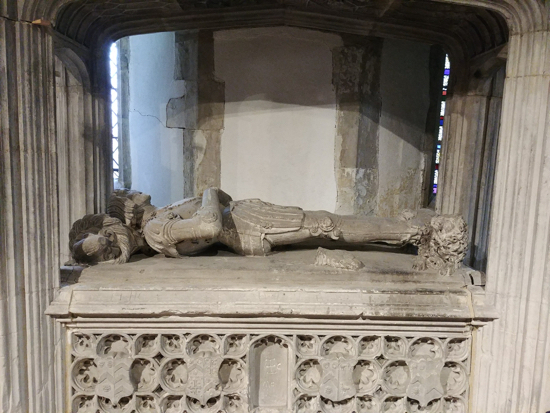 Thomas Knolles, in his will dated 7 & 8 February 1445 (PCC Luffnam fo 30, refers to his wife Isabel already deceased; mentions his son Robert (to whom he left the manor of North Mymms), his son Richard, and his son John. He mentions also his daughter Beatrice as a nun at Dartford; his daughter Johanna as wife of William Baron, and a daughter Isabella. Robert, eldest son and heir of Thomas, appears to have invested more time at North Mymms and was unfortunately responsible for cutting down much timber belonging to the manor, which, until then, appears to have been thickly wooded. Perhaps he was under some financial pressure, for just after the death of his father he came to an agreement with his brother, Richard, to pay him 100 marks yearly from the North Mymms estate. Robert married Elizabeth, daughter of Bartholomew Seman, a goldsmith of London. Their son and heir, Robert, married Elizabeth Troutbeck of Dunham, Cheshire, widow of Sir Hugh Venables and daughter of Sir William Troutbeck, Chamberlain of Chester. 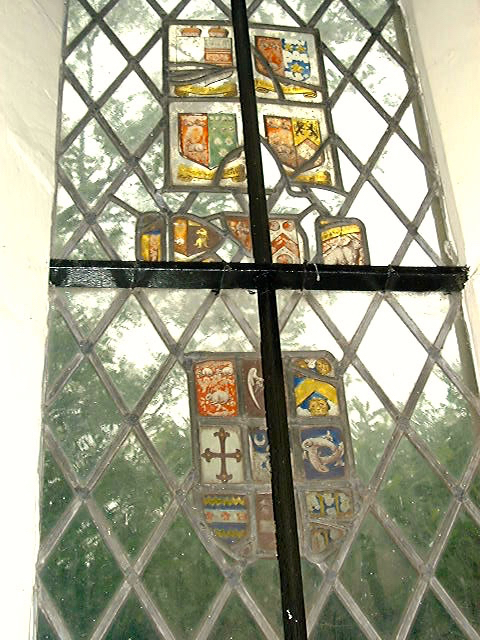 Elizabeth's brother, Sir John Troutbeck, was killed at the battle of Blore Heath in 1459 (the first battle of the War of the Roses), fighting on the Lancastrian side. 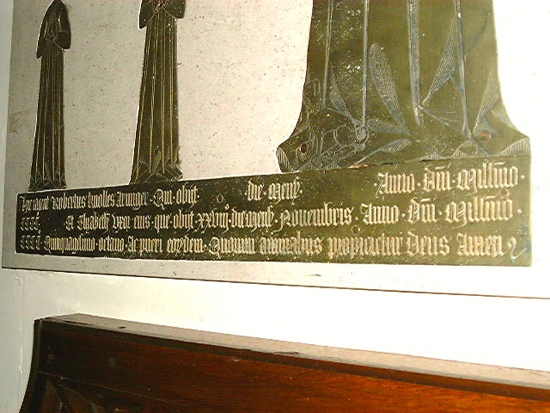 Robert and Elizabeth had four children, two boys who died young, as represented on the brass memorial in the chancel of St Mary's Church at North Mymms, and two daughters, Anne, who married Henry Frowick, and Elizabeth who married James Stracheley. "Here lie Robert Knolles, esquire, who died [blank] day of the month [blank] the year of our Lord one thousand four hundred [blank] and Elizabeth his wife, who died the 28th day of the month of November, the year of our Lord four hundred and fifty eight : and their sons ; God have mercy on their souls. Amen"
With his death the main branch of the Knolles family died out, to be continued in a cadet line by his brother Richard, ancestor of Sir Francis Knollys, and the current Viscount Knollys. North Mymms manor was divided into two halves with each daughter receiving a moiety. 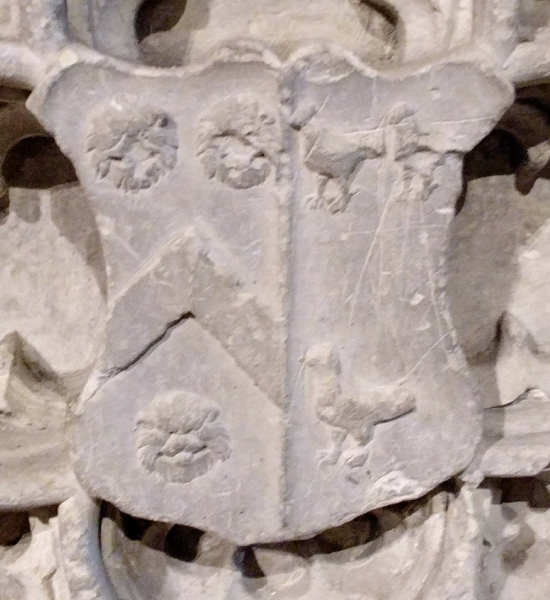 The Frowicks were neighbours of the Knolles, having owned the South Mimms manors of Old Fold (which comprised 132 acres) since 1271, and Durhams (comprising 350 acres) since 1368, and whose memorials are to be found in the church at South Mimms. Prosperous London mercers and goldsmiths, they had also held the mayoralty in 1435 and 1444 and had married into notable families such as the Throckmortons and Lewknors through whom they were descended from the Plantagenets. However, by the time Henry Frowick married Anne Knolles, the family was in financial trouble, having sold off large properties to meet debts. Henry and Anne had two children - a son, Thomas, who married Mary, daughter of Sir William Sandys, and a daughter Elizabeth who married John Coningsby of Lincoln. 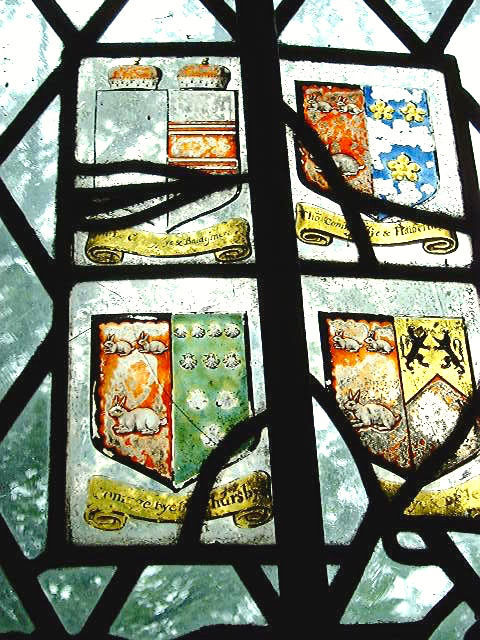 Thomas Frowick died without issue during his father's lifetime, so Henry left the moiety of North Mymms manor to his daughter, Elizabeth, and her children by John Coningsby, in his will, dated 1527. 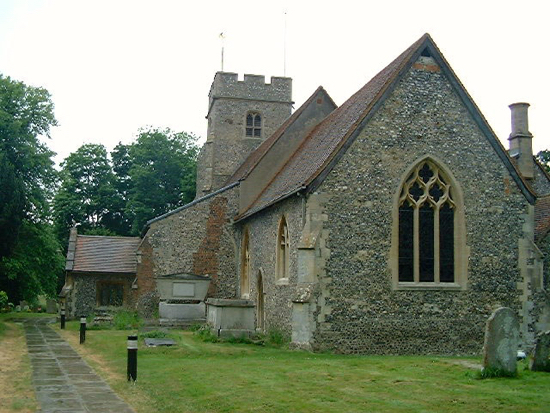 Henry and Anne were buried in the Frowyk Chantry in the church of St Giles, South Mimms. 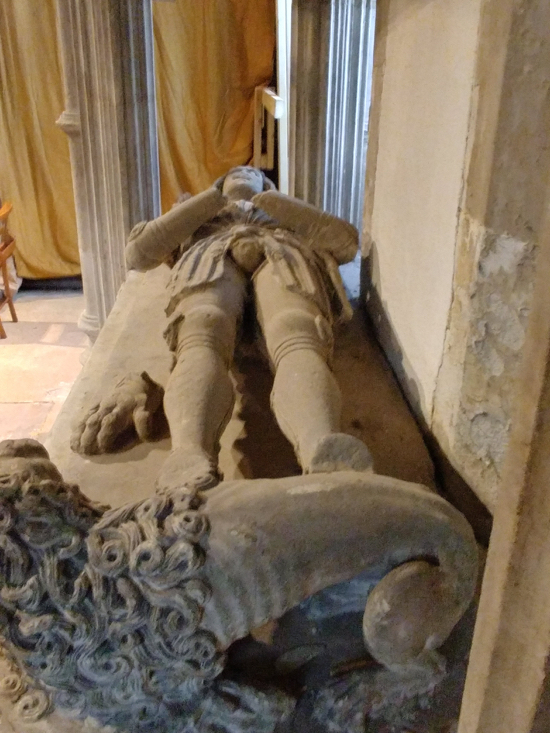 After talking to William Marsterson, the churchwarden at St. Giles, South Mimms, it appears that Rosie Bevan's account is almost correct, but that she may have mistaken the identities of the occupants of the two tombs inside the church. "Your source in New Zealand referred to Henry Frowyck's (d. 1527) wife Anne (Knolles) as being buried with him. I can't find the evidence for this, but Joanna Freedman (in my bibliography) believed this to have been so; she survived her husband (was named as an executor in his will, proved in 1527). 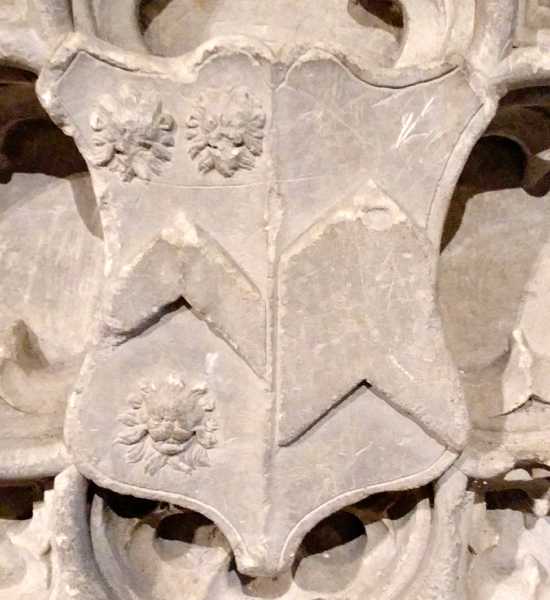 However the shields on the tomb in the Chantry Chapel indicate that the effigy is the offspring of a Frowyke and a Knolles, so therefore not Henry, but his son, Thomas d.1523. 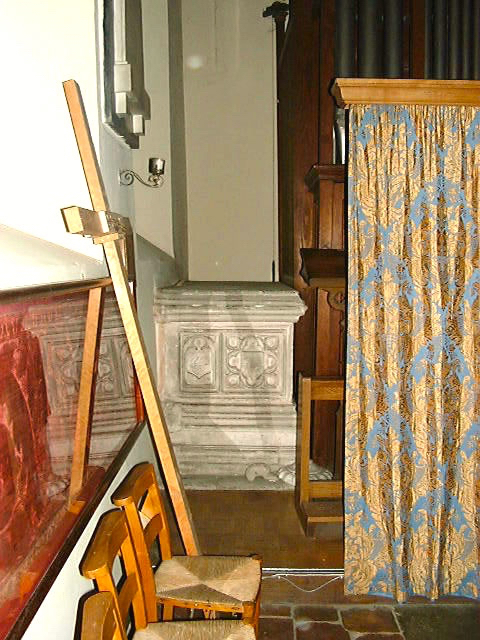 So Henry (and probably Anne's) tomb is the one in the Chancel." The shields William referred to are among the pictures added below. "The spelling is all over the place! Frowycke Avenue in South Mimms is spelled that way. 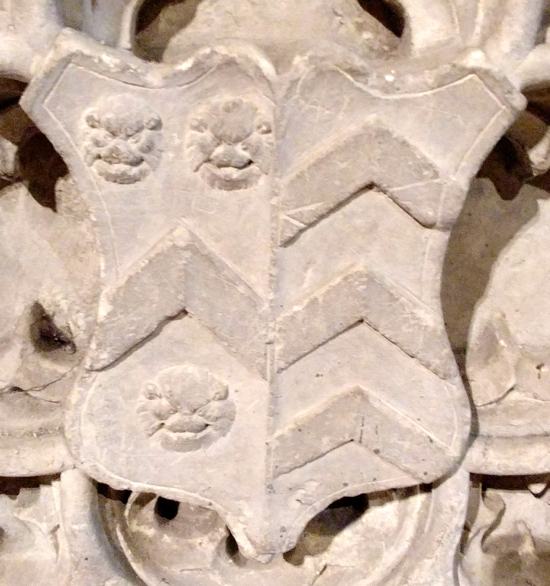 The big tomb in front of the altar (Henry F d. 1386) has Frowyk and that was the spelling Joanna Fredman used. Cass and Brittain use Frowyke consistently." The Cass and Brittain William refers to both produced detailed books about South Mimms, both of which are referred to in William's book. While talking to William I took some pictures of the tombs of both Thomas and his father, Henry, these images, and details from the tombs, are below. 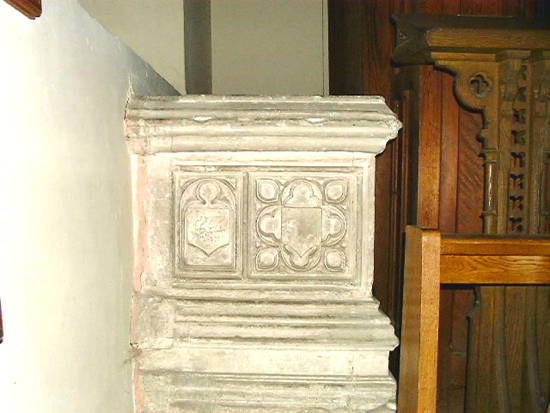 Thomas Frowyck's tomb at St Giles in South Mimms has four shields along the side, referred to by William Marsterson above. They are listed on page 66 of Cass's book about South Mimms. The details of the listings have been added to the images below. The spelling is as it is in the original listing. ... end of online editor's notes. The two moieties of the North Mymms manor were reunited in 1529 when James and Elizabeth Stracheley conveyed their half of the manor to John and Elizabeth Coningsby. Elizabeth, surviving John, continued living at North Mymms with her second husband, William Dodds, whom she married about 1557. Sir Henry Coningsby, her son, died in possession of the manor in 1590 and it was held by his descendants until sold in 1658. 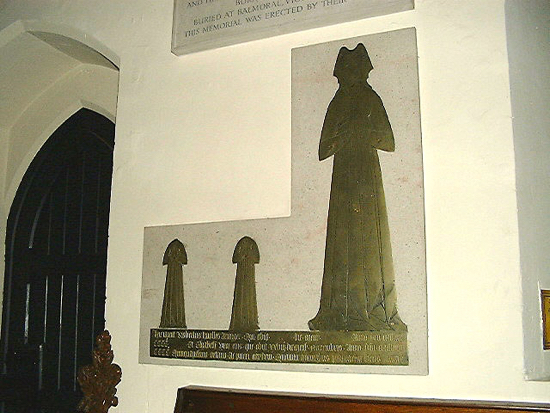 A guide to St Mary's Church has the following note about the monumental brass west of the Priest's Door in the Chancel dedicated to the Knolles family. The effigy in armour is lost and the two daughters (or sons?) are headless. 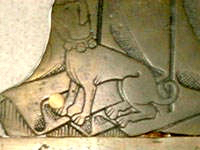 The lady is in the period dress and at her feet has a lap dog with a collar and bells. 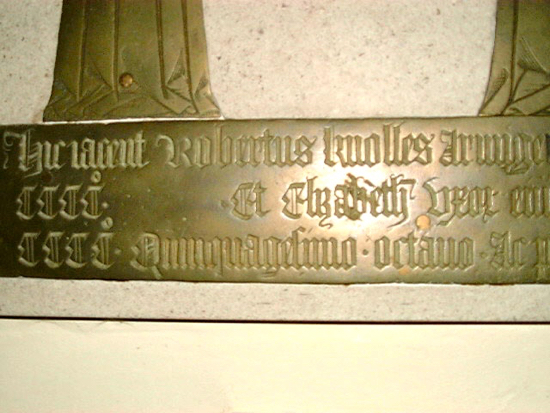 It will be noticed that the date of death of Robert, on the inscription, is left blank, inferring that he survived his wife. The memorial was completed in 1818 when R. Clutterbuck wrote the history of the county. The prayer for the deceased at the end of the inscription has been partly defaced but can easily be made out at 'Quorum animabus propricietus Deus Amen'. Robert was the granson of Thomas Knolles who acquired the Manor from the Swanlands in 1428, and he was the last male of the family. He in all probability added the tower of the church known as the West Tower. His two daughters inherited from him and one, Anne, married Henry Frowick of South Mimms. They had a daughter, Elizabeth, who became the wife of John Coningsby about 1530, and it was their grandson, Sir Ralph, to whom is attributed the erection of the present house in North Mymms Park at the close of the 16th century. He was knighted by James I. A guide to the church has the following note about St Catherine's Chapel, a small area of the church hidden behind a curtain containing an organ, stacking chairs, an easel and a tomb. 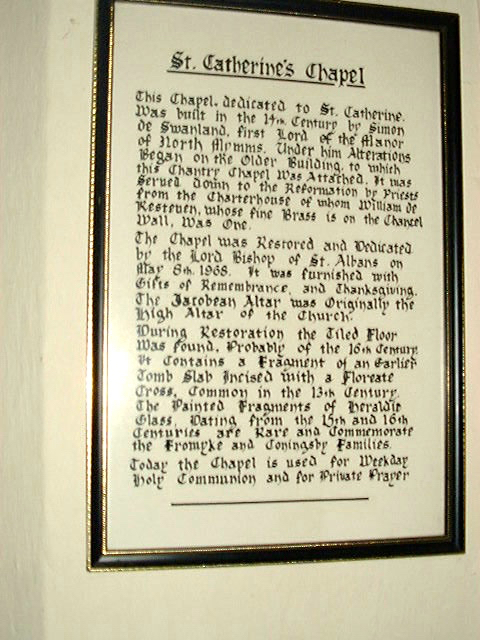 There is also a framed description of the chapel on the wall. 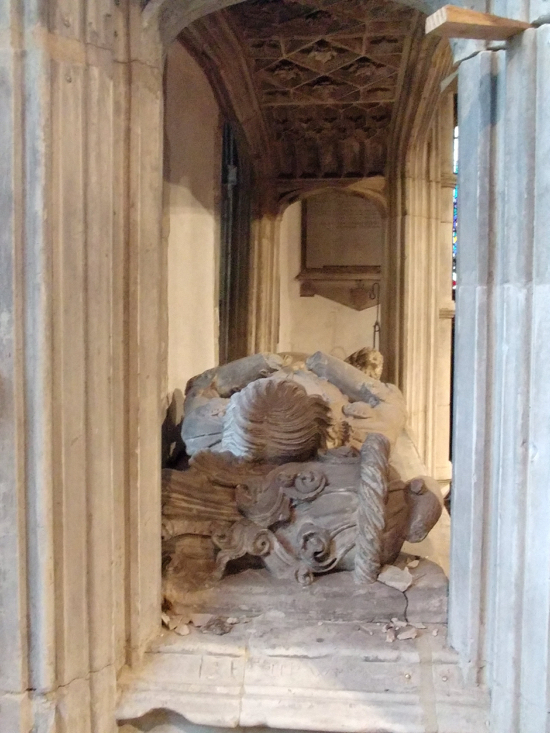 St Catherine's Chapel: A wooden floor was removed in the 1971 restoration revealing medieval tiles and a curious carved stone, possibly from a tombstone. 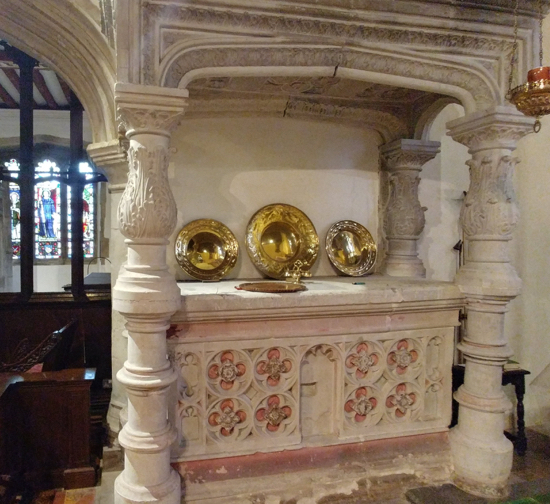 In this chapel is the organ of 1894, the remaining fragments of medieval glass, the 16C tomb of Elizabeth Frowick, later Coningsby, and the crimson Dossal dates as Italian 16C by the Victoria and Albert Museum and presented to the church by Mrs Walter Burns. 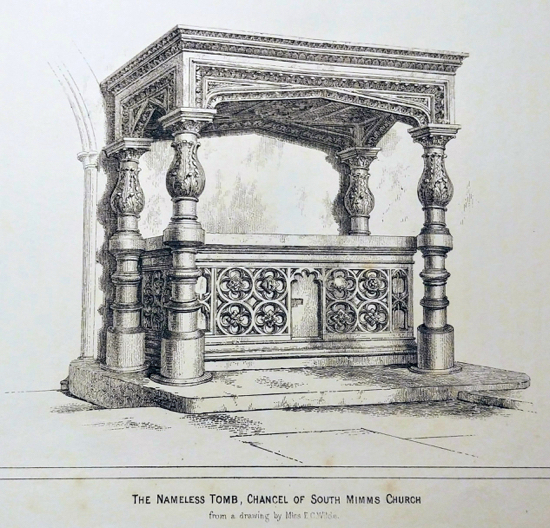 The church guide suggests that Elizabeth Frowick's grandfather was Robert Knolles who in turn was the grandson of Thomas Knolles who it is thought built North Mymms Manor. 4.Public Records Office Attornment by Robert Knolles, esquire, son and heir of Thomas Knolles, late citizen and grocer of London, deceased, to Richard Knolles his brother, whom he has put in peaceable possession, by the payment of 1d. of a yearly rent of 100 marks issuing from the manor of North Mymmes. 29 March, 24 Henry VI.